Aracely Hernandez holds a campaign sign while trying to encourage people to vote Tuesday, March 6, 2018, at Lark Community Center in McAllen. Hidalgo County saw a slight increase in voter turnout during the early voting period ahead of Tuesday’s primary election. More than 39,000 registered voters cast their ballot during the 11-day early voting period, which began Feb. 20 and ended March 2, according to unofficial results from the Hidalgo County Elections department. That’s about a 3 percent increase in early voter turnout when compared to the last non-presidential primary in 2014. In Starr County, more than 10,800 voters cast a ballot during the same time frame. Election officials there did not have figures for the 2014 primary immediately available Monday, but when compared to the 2016 primary, voter turnout increased by 19 percentage points. Voters there have more than a dozen contested races on the ballot, including one that could unseat the current county Judge. Leticia “Letty” Garza Galvan is vying for the seat held by incumbent Eloy Vera. 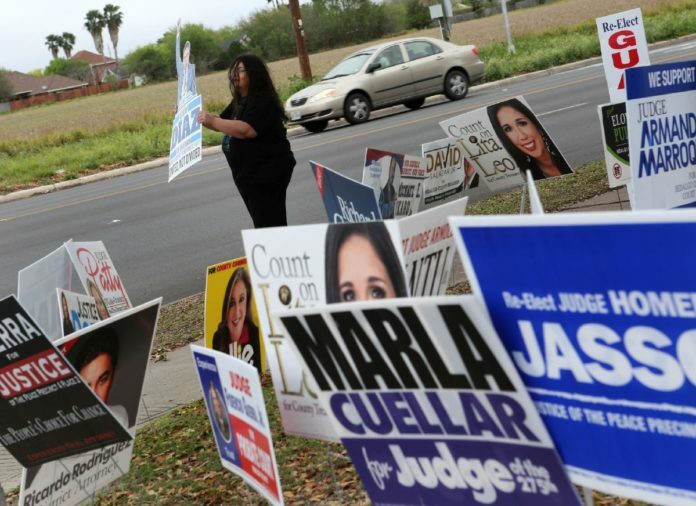 In Hidalgo County, voters will elect a new county judge no matter how they vote. The race is perhaps the most hotly contested one on the Democratic ballot with former McAllen Mayor Richard Cortez and former Hidalgo County Judge Eloy Pulido vying for the seat. Whoever wins the primary will face Republican candidate Jane Cross in November. The number of mail-in ballots continued to flow in until the last day of early voting, with a total of 2,488 absentee ballots cast in Hidalgo County. The total number of absentee ballots cast in Starr County were also not immediately available Monday, but more than 930 mail-in ballots had been received within the first six days of early voting, according to elections officials there. Follow The Monitor’s Twitter page, @monitornews, for election results.